I made this breakfast "cake" this weekend. With fruit, veggies, and flax seed, it's quite healthful and ideal for breakfast, brunch, snack, or even dessert. For a gluten-free recipe it's quite easy and by using palm sugar (also called coconut sugar) the recipe will be easy on the blood sugar. I think you'll find kids and adults will both enjoy this treat. Preheat the oven to 350°F. Grease an 8 x 8 baking pan. Mix the 1 Tablespoon of ground flax seed with 2 Tablespoons of boiling water to make a slurry. Set aside. In a large bowl, whisk together the sorghum flour, palm sugar, baking soda, cinnamon, nutmeg, and salt. Combine the eggs, vanilla, apples, carrots, and flax seed slurry in a blender or food processor. If using the blender, start on a low speed and quickly increase to high until thoroughly mixed. If using a food processor, pulse many times until combined and then process until smooth. Batter will be thick. Add the wet ingredients to the dry ingredients and fold them in with a rubber spatula until thoroughly combined. Pour the batter into the prepared pan and bake for 25 to 30 minutes, until a toothpick inserted into the center comes out clean. Let cool completely in the pan. 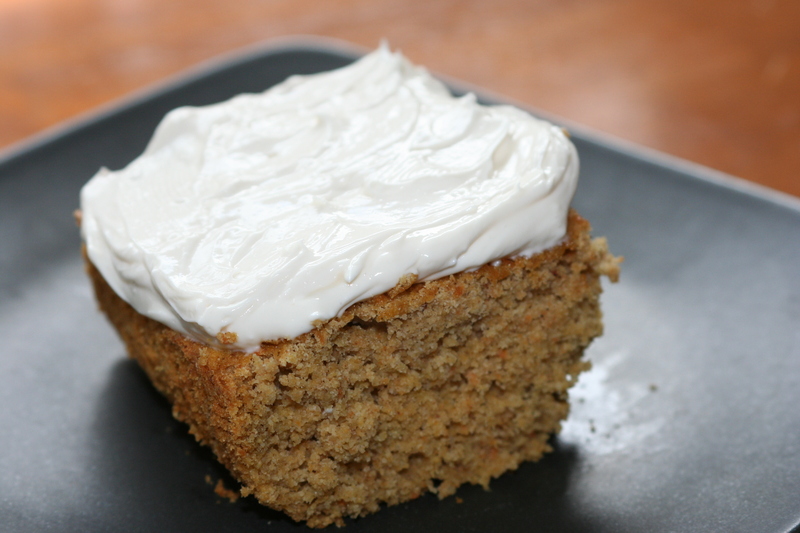 Top with freshly whipped cream, cream cheese frosting, yogurt, or syrup. Cooks Note: Sorghum flour and palm sugar can both be found at health food stores, as well as online.